In the bowl of a stand mixer, combine flours, baking powder, salt and herbs. Cut in butter and mix until mixture resembles coarse crumbles. Add milk and mix until dough is soft and starts to pull away from the sides. Pour out dough onto a lightly floured surface and knead for about 30 seconds. Roll out dough, using a lightly floured rolling pin, to a 1/2-inch to 3/4-inch thickness. Cut into rounds using a biscuit cutter and place on baking stone or parchment paper-lined baking sheet. Bake 12-15 minutes until lightly brown; serve warm. I think we can pretty much all agree that biscuits are amazing. Whether they're fluffy and light, dense and buttery, sweet or savory, plain or doused in gravy or jam, biscuits just make the world a better place. 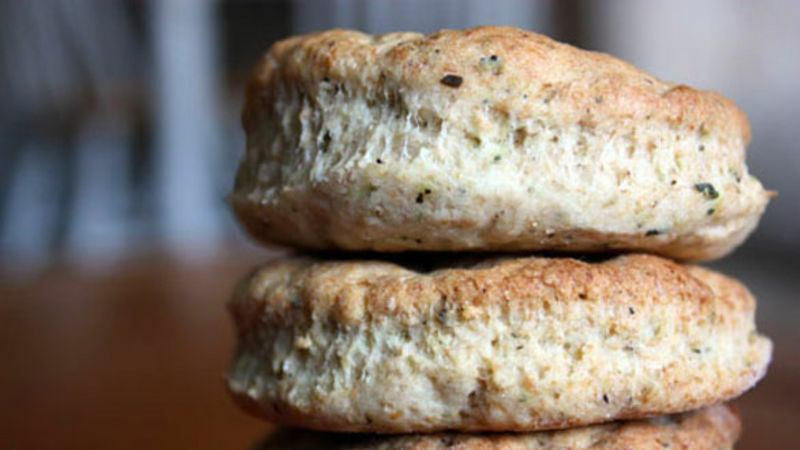 What's even more amazing about biscuits is how easy they are to make. Just mix a bunch of ingredients together, cut circles out of the dough, bake them for a few minutes and voila! It's biscuit time. These Savory Wheat Biscuits are just the thing to make when you're craving some cuddle time with a biscuit. Don't let the name fool you -- despite the fact that these sound and may even look like boring biscuits, they're not. The flurry of Italian seasonings, small cubes of butter in the batter and light wheat taste -- not to mention the fact that they're fluffy! -- all complement each other in a way that is perfectly subtle, yet flavorful. Plus, they're biscuits. I think that sums it up quite well. Serve these biscuits warm with extra butter or cut them in half, toast them and place them over soup, almost like dumplings (trust me, it's good!) You can even use the biscuit dough as a pie crust for Tomato Pie or a Chicken Pot Pie. Whatever you decide to do with this recipe, it will undoubtedly make your day even a little bit brighter. I think we can pretty much all agree that biscuits are amazing. Whether they're fluffy and light, dense and buttery, sweet or savory, plain or doused in gravy or jam, biscuits just make the world a better place. What's even more amazing about biscuits is how easy they are to make. Just mix a bunch of ingredients together, cut circles out of the dough, bake them for a few minutes and voila! It's biscuit time. These Savory Wheat Biscuits are just the thing to make when you're craving some cuddle time with a biscuit. Don't let the name fool you -- despite the fact that these sound and may even look like boring biscuits, they're not. The flurry of Italian seasonings, small cubes of butter in the batter and light wheat taste -- not to mention the fact that they're fluffy! -- all complement each other in a way that is perfectly subtle, yet flavorful. Plus, they're biscuits. I think that sums it up quite well. Serve these biscuits warm with extra butter or cut them in half, toast them and place them over soup, almost like dumplings (trust me, it's good!) You can even use the biscuit dough as a pie crust for Tomato Pie or a Chicken Pot Pie. Whatever you decide to do with this recipe, it will undoubtedly make your day even a little bit brighter.